A bizarre case against three people accused of promoting themselves as members of a fraternal police force that traces its roots back 3,000 years partly collapsed when the charges against one defendant were dismissed and the organization's so-called chief suddenly died. A website for the Masonic Fraternal Police, which claims jurisdiction in 33 states and Mexico, said the group was created by the Knights Templar in 1100 B.C. The criminal case unraveled when David Inkk Henry, the 47-year-old "grandmaster" of the organization, died of a pulmonary embolism on Monday — hours after appearing in a Los Angeles County court, the Los Angeles Times reported (http://lat.ms/1VgAVPK). Earlier in the day, a judge dismissed charges against Brandon Kiel, a former staffer with the California Department of Justice whom authorities said impersonated a police officer and misused his government-issued ID.Another defendant still faces charges. Detective Amalia Hernandez testified that Kiel did much of the talking and said the group would only handle matters internal to the Masonic group. Kiel also said the state Department of Justice was well aware and supportive of the Masonic Fraternal Police Department, Hernandez said. The three people were initially charged with misdemeanor counts of falsely representing themselves as police officers; Henry also was charged with three felony counts of perjury. Prosecutors later accused them of perjury and conspiracy to commit perjury by procuring fee-exempt license plates from the state Department of Motor Vehicles. 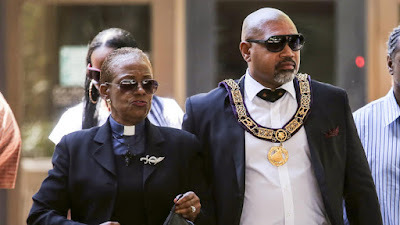 In their trial appearence last June, the defendants, Henry, Brandon Kiel (Henry's son-in-law), and Tonette Hayes, wore Masonic regalia to court (and Hayes also wore a minister's collar). The bogus group's website referred to Henry as "Absolute Supreme Sovereign Grandmaster." Kiel was an aide to California Attorney General Kamala Harris until he was charged in the case, when he was placed on administrative leave. As the only remaining defendant on the case, Hayes is scheduled for a pretrial hearing on April 29. She faces a maximum possible sentence of two years in county jail if convicted as charged." The trio accused of running a so-called Masonic police department created the agency in an attempt to improve relations between African Americans and law enforcement, said a lawyer for one of the three defendants. Attorney Gary Casselman said that the trio believed they were doing things aboveboard and had filed paperwork to carry weapons, applied for the type of vehicle license plates used by government agencies and sent letters introducing themselves to police departments. "It was supposed to be somewhere where people who didn't trust the regular police could go and make their reports of misconduct known and then these folks, the Masonics, would take it to recognized police," Casselman said. "They would be a go-between." 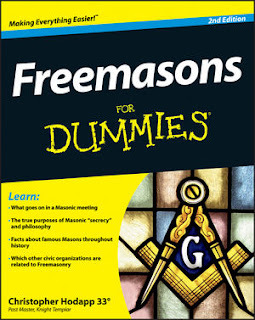 Here in the UK much of the distrust of Freemasonry has stemmed from the false impression that Masons involved in the criminal justice area give Brethren a "pass" when they discover that men hauled before justice are Masons. When I read the headline above, I thought to myself "Good grief! 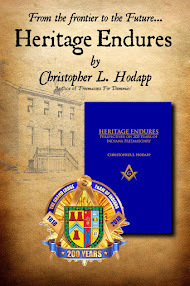 Are those false rumours about Masonic police and judges really true?" I exhaled a sigh of relief when I read the article. We're off the hook this time.